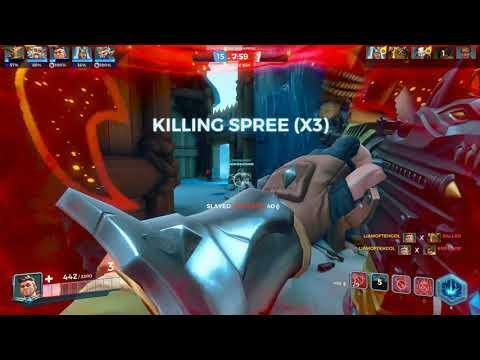 For those curious about Steam Play and wanting to test it out a little, the free to play fantasy team-based shooter Paladins seems to work rather nicely. You might be wondering why this is so interesting? Well, the more we can get working on Linux the easier it will be for people to switch. For some, this might be that one killer game they can't be without. It's constantly in the top 30 most played games on Steam and it can now be played on Linux without much effort at all. One issue is that the .net installer fails, which can be safely ignored. It will ask to install each time and each time you can just tell it to stop. Odd, but it works. If it bothers you, installing dotnet40 with Protontricks will solve that little issue. For me, that then creates a new issue of it complaining about missing Windows XP Service Pack 3 but a quick click and that's gone, which is still an improvement on waiting around for the .net installers to cancel them and play. So, not quite perfect but so minor it's not really a problem. Considering all the issues I deal with from Linux games on a daily basis, that's nothing. The important thing is how it feels to play and it does feel like any other game, which is awesome. Not entirely sold on it myself though but it's another option. I should note, that with multiplayer titles and Steam Play there's nothing stopping the developer adjusting their anti-cheat which could end up locking-out Linux gamers much like Darwin Project did. So keep your expectations in check, for now though it works fine and performs really well. How can you even install it? It says "Is already in your steam library", well it's not under "Games" (unfiltered) and not under "hidden"... and "Play now" just says: "An error... (invalid platform)"
Maelrane How can you even install it? It says "Is already in your steam library", well it's not under "Games" (unfiltered) and not under "hidden"... and "Play now" just says: "An error... (invalid platform)"
Do you have steamplay enabled for all games? Do you already have the game installed maybe? See if you can remove it or find the files on the disk and delete the Paladins directory if it is there. I installed Paladins through the steam store btw. Just press install/play there, installed it, and off I went! Press the install button there and then Steam should pop-up with a install window. I can vouch for the performance on Mesa. On both Ubuntu and Arch this game was Locked to 144Hz (Vsync Enabled) maxed out. The worst part of that is realizing that Easy Anti-Cheat which should be an arbiter for fairness is the culprit of a lot of unfairness due to restricting legitimate users from playing the game. Patola Some people are saying that if you get the EAC DLLs of Paladins and use it in other EAC games (overwriting their version), the game starts working under Linux. Maybe it works for the Darwin Project? Honestly, I'd be real wary of trying this - it's like asking for a ban (I mean, you're replacing the anticheat with a different version after all). Yeah, i wouldn't do that. Asking for trouble and then you don't know if it happens (bans) because EAC changes or because you changed the files. Yeah but at least you can play EAC-enabled games with GVT-g now. Hopefully Paladins working is a sign of an updated EAC working in Wine. Interesting. Do you have any report of someone making that work with dead by daylight ?